Bob Devaney, then head coach of Husker football, talks after his national championship team was honored by President Richard Nixon (right) during a Jan. 14, 1971 celebration in the Coliseum. Also pictured in the background (seated between Devaney and Nixon) is Joseph Soshnik, the university’s 13th chancellor. Two years after his inauguration, President Richard Nixon visited the University of Nebraska–Lincoln to honor the Huskers’ first national football title. During the Jan. 14, 1971, event in a packed Coliseum, Nixon presented a presidential plaque to coach Bob Devaney and team captains Dan Schneiss and Jerry Murtaugh. The plaque noted Nebraska’s No. 1 ranking by the Associated Press, Orange Bowl victory and Big Eight championship. Devaney was humbled by the president’s visit. 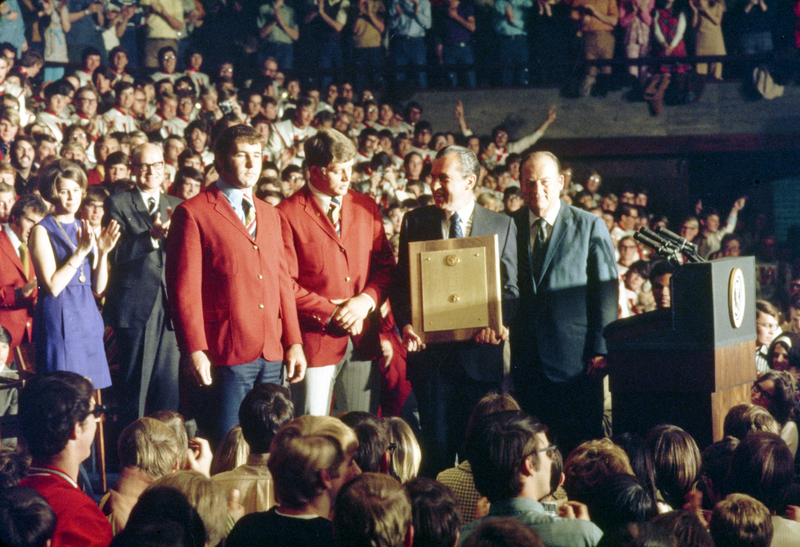 President Richard Nixon honored the Huskers 1970 national championship football team with the presentation of a presidential plaque during a Jan. 14, 1971, celebration in the Coliseum. Nixon (holding the plaque) presented the award to (from left) team captains Jerry Murtaugh and Dan Schneiss, and to head coach Bob Devaney. He further called for rolling the Peace Corps, VISTA and other volunteer agencies into the national center. Nixon said he planned to send a message to Congress asking for the merger. The presidential visit came in the days of Vietnam War protests nationwide. Due to the celebratory nature of Nixon's visit, no major upheaval was recorded on campus that day. However, two minor protests — including a student chant of “Peace now” that was drowned out by applause — quickly fizzled. The other “protest” came as Nixon walked across campus and a student tossed a snowball at the president. Nixon responded by making his own snowball and playfully lobbing it toward the student. Today, another politician will visit the Coliseum and talk directly to students as Nebraska’s 150th year celebration rolls into Charter Week. Sen. Ben Sasse (R – Nebraska) will discuss how Huskers can change the future in a face-to-face discussion with students at 5:30 p.m. The presentation is open to students, faculty and staff. Tickets are available at the welcome desks in the unions on City and East campuses. A valid NCard is needed to receive a ticket and for admission into the talk. Learn more about the conversation with Sasse and other Charter Week events.